If you’ve had enough of the chevron craze, come take a look at what one of our favourite brands is up to. Oh, and there’s some long-awaited news as well! We’re never ones to shy away from a beautiful print, so we’re happy to shout from the rooftops that Olli Ella has launched a gorgeous new print in its linen range – harlequin. It’s understated, classic, unisex… and we love it. The Harlequin Dawn has just the faintest hint of a pastel colour, while the Harlequin Dusk is muted grey at its best. 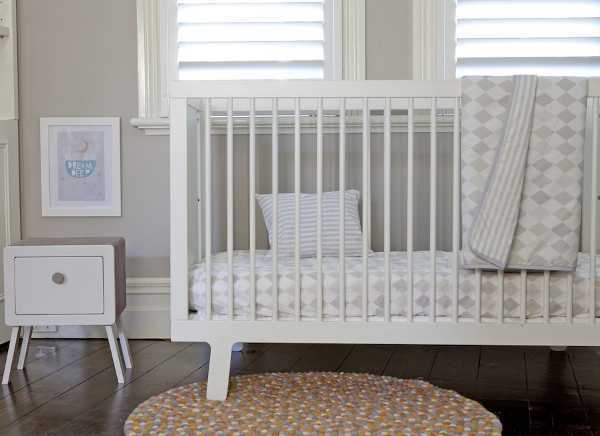 The cot bed sets ($195) include a reversible quilt that’s also perfect as a play blanket and two fitted sheets, one in the harlequin print and the other in Dusky Stripe. Each harlequin print is also available in the fitted sheet sets ($115). And in even more exciting news, Olli Ella’s gorgeous range of linen is now available in single bed size. The bed sets, which include a single duvet cover, a pillowcase, fitted sheet and matching tote are $249. And they come in the new harlequin patterns, as well as the beautiful poppet, posey and piccoli. All of the sets are now available at Olli Ella.